Alisher Burkhanovich Usmanov was born on the 9th September 1953, in Chust, Namangan Province, (then) Uzbek SSR, Soviet Union, and is a businessman, who is probably best recognized for being a shareholder of Metalloinvest, a Russian industrial conglomerate, which operates with metal, mining and investments. He is also the owner of the Kommersant Publishing Houses, MegaFon, and Mail.ru group. Beside that, he is a shareholder of English soccer club Arsenal F.C. So, have you ever wondered how rich Alisher Usmanov is, as of late 2016? According to authoritative sources, it has been estimated that Usmanov counts his net worth at the impressive amount of $14.4 billion, making him Russia’s richest man, and the 58th wealthiest person in the world. This sum of money has been accumulated through his successful career in the business industry, as the owner of several companies and conglomerates. Alisher Usmanov grew up in Tashkent, where his father worked as a state prosecutor. Upon matriculation, he had a plan to pursue his career as a diplomat, so he relocated to Moscow and enrolled at Moscow State Institute of International Relations, graduating in 1976 with a BA degree in International Law. Later he was a student of Banking at the Academy of Finance in 1997. Following graduation, he returned to Tashkent, and began working as a director of the Soviet Peace Committee’s Foreign Economic Association. In 1980 he was arrested on fraud charges, and was in jail for six years, after which the court cleared his record adjudging that no crime had been committed, and Usmanov began to pursue further his career. In 1999, Usmanov co-founded Metalloinvest together with Vasiliy Anisimoy. The company became one of Russian’s industrial conglomerates which operate in metal and mining industries. This added a considerable amount to his net worth, as the company owns a huge number of businesses, including Oskol Elektrometallurgical Plant, Lebedinsky GOK and Mikhailovsky GOK, and Ural Scrap Company. Ten years later, Usmanov bought a 2% share of the social network platform Facebook, as well as other websites including Twitter, Alibaba, AirBnB, and 360buy. The owner of all of these shares is his company Digital Sky Technologies, the name later being changed to Mail.ru Group. Beside that, he is also the owner of MegaFon, a mobile telephone operator which is the second largest in Russia, which increased his net worth by a large margin. Usmanov is also known for being the general director of Gazprom Invest Holdings, a gas company, and in 2006 he bought the newspaper “Kommersant” for $200 million, and he is also the co-owner of UTH, a media holding company which owns Disney Russia, U, and Muz TV channels, adding to his net worth. In 2007 he moved his attention to the sports industry, acquiring one part of the English soccer team Arsenal Football Club, and in the following year he became a sponsor of the Russian football team Dinamo Moscow, which has also increased his fortune. 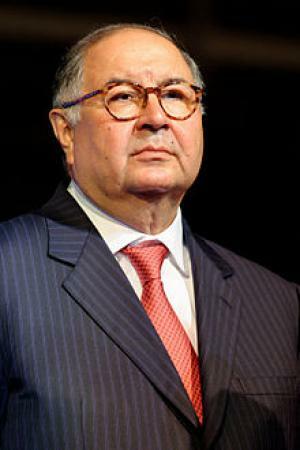 Thanks to his accomplishments, Usmanov has won a number of recognitions, including Medal of Honor in Russia in 2004, Order of Alexander Nevsky in 2014, among others. Speaking about his personal life, Alisher Usmanov has been married to rhythmic gymnastics coach Irina Viner since 1992; he adopted her son from her previous marriage. In free time, he is very active as a philanthropist, who has collaborated with various organizations such as the National Research University Higher School of Economics, Russian Geographical Society and European University in St. Petersburg. Awards Order of Alexander Nevsky, Order of Honour, Order of Friendship, Order "For Merit to the Fatherland"